The forefathers and the aboriginal people had already discovered the hot springs in Jiaoxi when Wu Sha started tilling the land in Yilan. 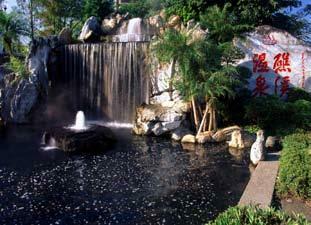 It is as a result that the old name for the location of Jiaoxi hot springs was Tangwei. Tang referred to the hot springs and Wei the trenches in which the hot spring flowed. Jiaoxi is surrounded by mountains. The hot spring trenches in the field centers send up streams of steam. The sight was named one of the eight spectacles of Lanyang and subsequently featured in enduring literary works by Wu Zhufang and Ke Peiyuan, as well as Chen Shujun, a provincial graduate of the Imperial Examinations during the Qing Dynasty. When the Han first arrived here, they did not consider the hot springs to be valuable natural resources. They even worried that the hot water temperature might damage the crops and hence the saying "let's not develop this place into a boiling pot". After the Japanese took over Taiwan, their love for hot springs started the commercial use of the hot springs in Jiaoxi. With Jiaoxi hot springs (Tangwei) as the center, deliberate planning carefully formed the early shape of today's Jiaoxi community. In recent years, the Yilan government has been promoting tourism, culture, and environmental conservation as its visions for the county. Consequently the government has been encouraging and very supportive of the local tourism industry. 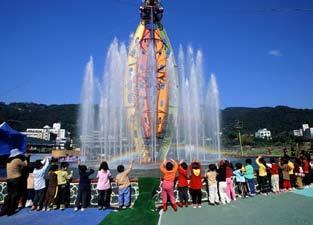 Jiaoxi hot springs have undergone rapid development and the number of tourists to Yilan has shot through the roof. Hot spring hotels and restaurants sprung up overnight. Construction firms and developers have built thousands of condominiums and vacation houses near the hot springs. Even successes have been reaped from cultivating vegetables with hot spring waters and developing warm-water fisheries downstream.